My April 2012 Glossy Box came through yesterday, It feels like ages since I got the infamous Harrods one so was quite exciting when it did come in the post. 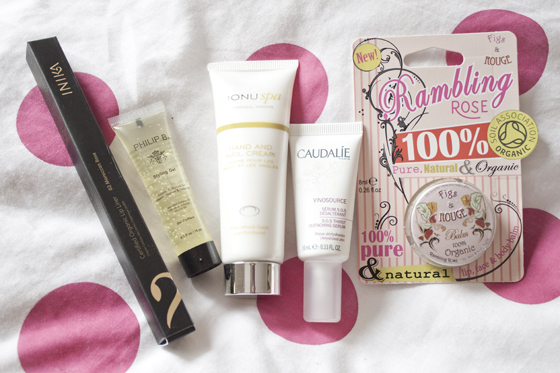 The novelty of beauty boxes has worn off for me now and Im a bit nonchalant when it comes to getting them. But, for a change I was pretty happy when I saw who the package was from. 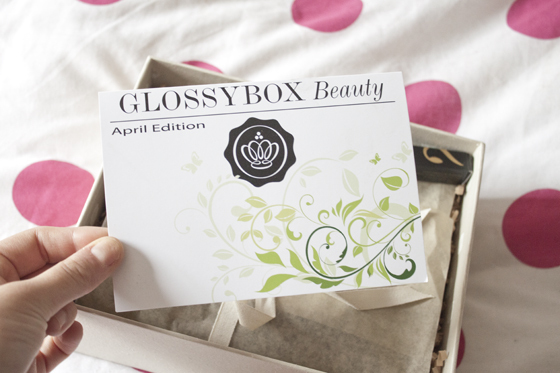 The theme for the April Glossy Box is "The Natural Box". Its nice to see another themed box. I do think these go down well and give a bit more consistency to the sampling scene. Caudalie Serum looks good and I've used it a few times since I got this box. 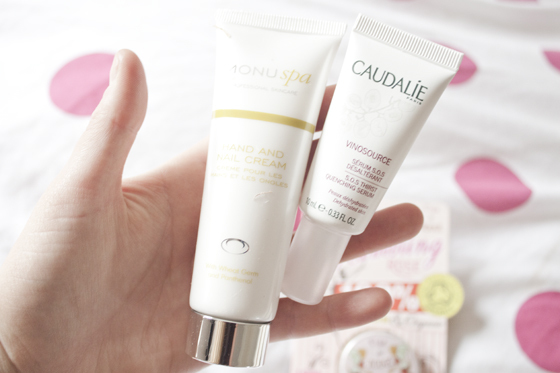 I love most of the Caudalie products I've tried in the past and my skin has felt dryer in the evenings recently so the ultra hydrating properties are much needed. I got the Inika Comsetics lip liner in a shimmery reddish colour, I can't see a colour name but I may be missing it! It's not to my personal taste and I don't like lipliners but it seems like a OK product, The Monu hand and nail cream will, like most hand creams in these sorts of boxes, might be badly received. I'm not a hand cream fan, but I'll just pass it on. I already have this Figs and Rouge lip balm which I didn't really like in the first place, so again thats going to be passed on to someone I know. The Phillip B styling gel is another product I probably won't use, the idea of a gel on my long hair doesn't sit well with me. All I can think of is really slicked back greased up hair! Overall, I really didn't get blown away by the box. I don't know if all the contents in the box are the same for all subscribers, they typically vary quite a bit from Glossy Box. 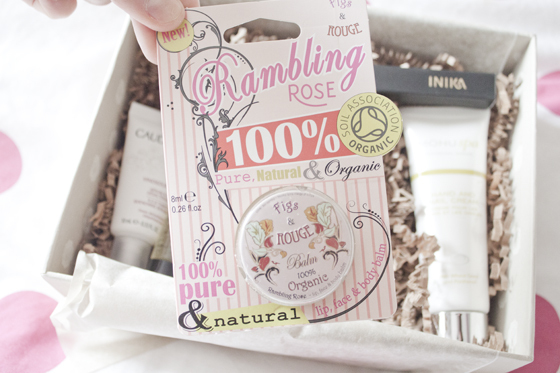 For a Eco box I didn't really see the theme coming through that strongly with the products. I felt it could have been pushed in another direction, different brands, or at least had more focus on organic and natural stuff. Nothing to me screamed natural or organic, despite the products being natural... I just can't explain what I mean really! They just aren't the things that spring to mind when someone says natural or organic. As far as Im aware the styling gel isn't eco, It feels like it was just thrown in there as a extra. The biodegradable box is a nice touch, but I still just think its all wastage at the end of the day. Are their other boxes not recyclable? I think as a company that obviously has a fair few subscribers they should have a bit more of a responsibility to keeping things as green as they can and having fully recyclable boxes. I do reuse my Glossy Boxes but I think there is so much wasted packaging! I know it's Glossy Boxes 1 year anniversary box next month and Im sure they will be promising big things! But I don't know how I really feel about these sorts of boxes in the long term. Im still on the fence if they are worth it or not! I will write another post on my feelings soon! This box has swung it for me. When I get paid, I'm definitely going to join! I haven't got mine yet so I'm excited to get mine soon to see what's inside. 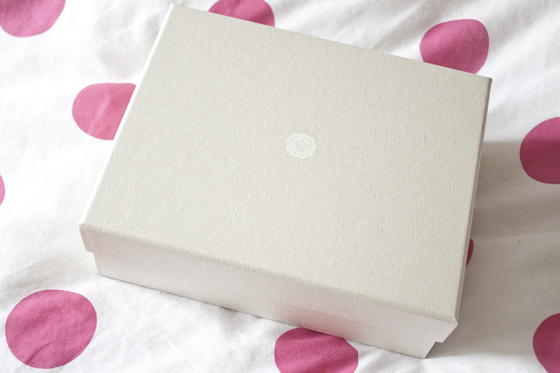 I know what you mean about the novelty wearing off though, however it's nice to see Glossybox trying to make an effort with these limited edition boxes. Oh wow, the packaging & wrapping are amazing! I think i'm gonna get me one of those too! 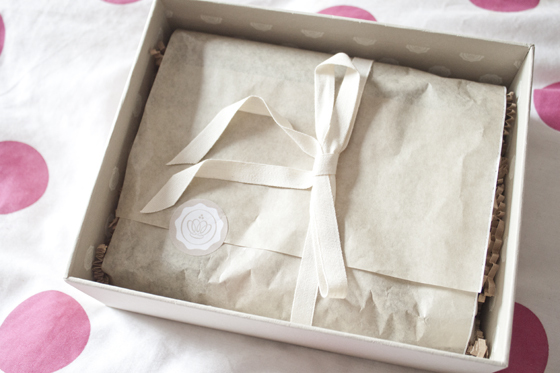 I really adore this as an idea for a box! I used to get a GlossyBox but unsubcribed two month ago. I unsubscribed a while back and now they have amazing products! got mine today... instead of styling gel and hand cream I got a full size coconut and jasmine shower wash which is yummy and means I wont have to buy one for a while :0) but also got a tiny fragrance oil which is YUCK :0( Would of preferred the hand and nail cream tbh as my desk at work is crying out for a new one and I hate most I try!!! 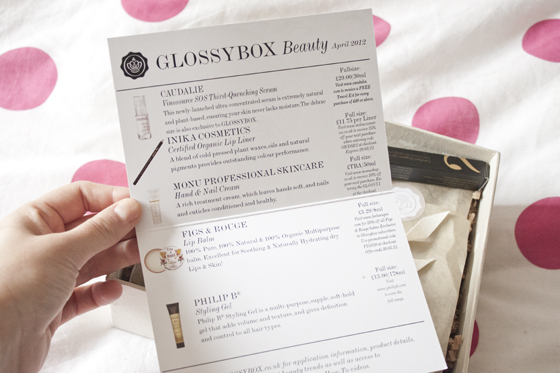 I really liked my box this month and I enjoyed last months.Have glossybox not teamed up with another box now? I got different products - an eyeliner,perfume oil and a body wash.
Oh you had slightly different products to me ..see http://beth92-beth92.blogspot.co.uk/2012/04/glossybox-april-2012.html this is my review of it. I loved the fig and rouge lip balm so much! i think im going to buy some more once the one i have runs out! your box is very similar to mine and i havent seen many variations yet, the lip liner is 42 morrocan rose the name is on the box not the pencil, it took me ages to find it aswell i thought it was a bit strange it was only on the box!